Since 2010 we’re working day in an day out with enthousiast people and great horses. We’re specialised in quarter horses (focus on reiners) and try to push all boundaries and focus on the sensation, welfare & results! To realise this quest we optimised our infrastructure, feeding, follow-up and training. This all with ‘performance’ and ‘welfare’ in mind! Since April 2017, you may find us at our new training facility in Herne (Belgium). After years of brainstorming, planning and hard work. We’re proud to show everyone our new training environment. We dispose of a covered arena (+60m by +30m) with adapted soil, a barn (+30 stalls) and a well thought set-up. Everything is surrounded by fields, grass and a magnificent view. 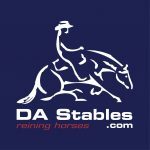 DA Stables is open to every non-pro and pro rider looking for quality, peace and performance. Next to our training programs, we’ve a limit number of pension spots in our barn. For more information (rates & conditions), you may contact us at your convenience.